A big surprise is sure to be had when you present this lovable birthday teddy bear! 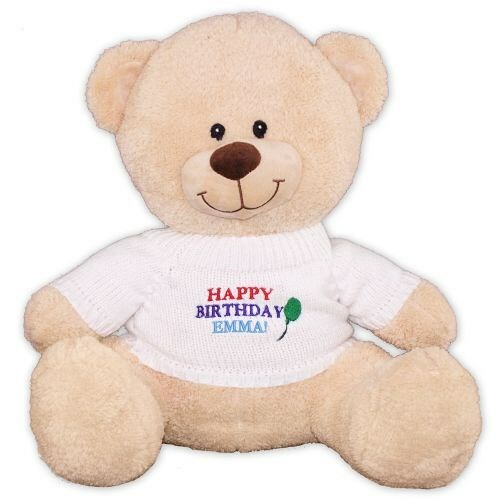 Wearing a white, warm and cozy sweater, this embroidered teddy bear makes a special treat for anyone celebrating a birthday. Happy Birthday is embroidered on this sweater along with any name. It is featured on our Sherman Teddy Bear. Sherman has contrasting tan fur on the inside of his ears and his snout. He measures 17" tall. Free personalization along with free gift wrapping and a free gift message are included to create a thoughtful presentation. Additional Details Let 800Bear.com be your number one choice for all of your Plush Birthday Gift Ideas.